Rich Tool Systems has everything you need to complete any project to perfection. 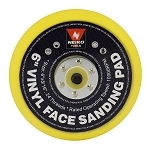 Sanding is extremely important for both preparation and finishing of materials, so we offer the highest-quality affordable sanding discs ready to stick on and go with no annoying backing paper to deal with. Stick-On Sandpaper rolls are convenient, efficient, and durable. Rolls of 100 gold sanding discs are available in grits of 80, 120, 150, 180, 220, 320, and 400 grit, all in 6" diameter. This long-lasting sandpaper resists loading through heavy duty stearate coating, extending its life. 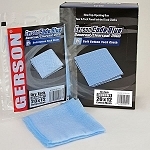 We also carry the backup pad that is suitable for flat or curved surfaces.